The Argentinian novelist, Andrés Neuman, had occasion to remark at a literary festival I recently attended in Cardiff, ‘Reading poetry is itself a kind of translation.’ This idea, that poetry is a medium which brings us all into the realm of the translator, is both challenging and suggestive. It implies that an act of decipherment lies at the heart of the pleasure of poetry, and also that a degree of ability to interpret may be as universal as the poetic act itself. This anthology began eight years ago with a similar principle – that poets were sufficiently intrigued by the expressive modes and strategies of other poets to find a way of leaping the language barrier in search of greater understanding of each other’s practice. The hope was that direct dialogue could lead to meaningful acts of translation, a deeper understanding of both our skills and their cultural relativism, and, ideally, publishable works in the target language. Practically speaking, this impulse manifested itself in a trip by some UK poets to meet with Chinese writers and work on translations of each other’s work in Beijing and the Wansongpu Writers Centre in Shandong Province, then a return trip by the Chinese writers to Cove Park in the west of Scotland. The originating figures were, on the Chinese side, Yang Lian and Tang Xiaodu, together with Xi Chuan, Zhai Yongming, Zhang Wei and Zhou Zan. On the British side, Polly Clark and Julian Forrester organized, and Polly, myself, Antony Dunn and Pascale Petit took part. On those two trips, translation went on in parallel, with the writers working both from Chinese into English, and from English into Chinese. It was a dialogue in several senses of the word, in that not only were we learning about each other’s poetry and its cultural and formal background through the act of translation, but that act was itself dialogic, ‘Poet to Poet’, as Polly called it. This was only the first of a series of exchanges, called, variously, the Pamirs, Yellow Mountain and Yangzhou festivals. These included readings and discussions as well as translations, and involved many other writers both British, Chinese, American, Nigerian, and from New Zealand. But at the heart of each of these exchanges was a pair of writers sitting down together and learning about each other’s writing and the principles behind it through the act of translation. Several names recurred, while others joined us, including, on the English-speaking side, Murray Edmond, Forrest Gander, Robert Minhinnick, Sean O’Brien, Odia Ofeimun, Fiona Sampson, Arthur Sze, George Szirtes, Eliot Weinberger and C.D. Wright. Other Chinese writers taking part included Duo Duo, Hu Xudong, Mang Ke, Ouyang Jianghe, Wang Xaoni, Xiao Kaiyou,Yan Li, Yang Xiaobin, Yu Jian, Zang Di and Zhang Er. Not everyone translated, and not all the translations were successful, but the strong impulse to engage in dialogue about poetry drove us all. These are distinguished names, and both the dialogues and the translation processes were so stimulating, it was inevitable that, eventually, we would think of publishing some of the results. Yang Lian and I had already collaborated on Jade Ladder (Bloodaxe Books, 2012), a comprehensive selection of translations into English of key poems from the last thirty years of Chinese poetry, the idea for which had arisen as a direct result of these festivals and exchanges. But we were always aware, firstly, that the translation process had gone in both directions, and, secondly, that a large anthology like Jade Ladder could not focus exclusively on that process. 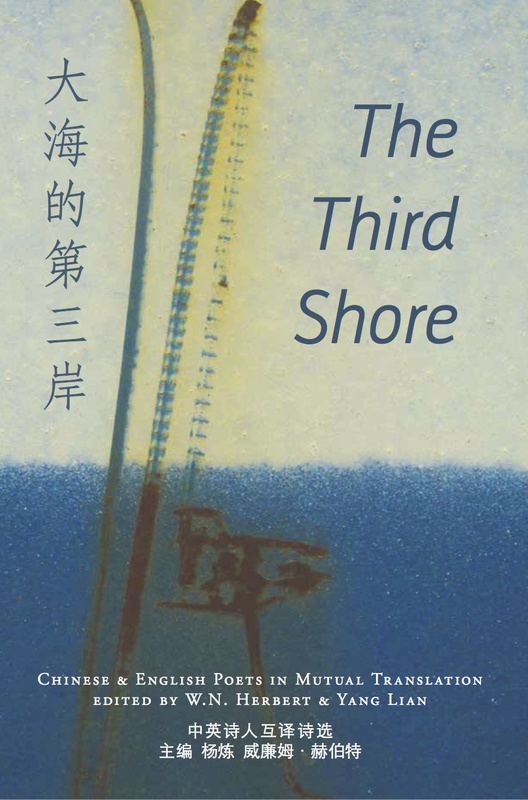 So we decided that a second, independent book was necessary: one that included English to Chinese translations alongside Chinese to English, and one that gathered its work primarily from the Poet to Poet translation method. That method had of course evolved over the years, not least because its application had spread. Yang Lian and other Chinese writers worked with Japanese and other poetries. Polly and Julian developed a similar project with Arab and Israeli writers; and I found myself translating from a number of other languages including Bulgarian, Farsi, Lithuanian, Somali and Turkish. Poet to Poet changed my practice as a writer and, as an academic, became my main research area. I began travelling to translate, engaging with other organisations like Aberystwyth’s Literatures Across Frontiers, Edinburgh’s Scottish Poetry Library, and the London-based Poetry Translation Centre; and with other co-translators like Linda France, Richard Gwyn, Martin Orwin and Zöe Skoulding. But both Yang Lian and myself never forgot that there was something unique about the translation process working between Chinese and English, something that informed all the other translation work we subsequently did. The gap between the two languages and between the two cultures could not have seemed wider – English, obviously, is represented by an alphabetic system which encodes its linguistic and cultural history within its orthography, so that to read it is to reach back through etymology into layers of time. Chinese, equally evidently, deploys thousands of characters which represent concepts and their interactions spatially through combinations of pictograms and radicals. The same characters can be used by quite distinct languages and pronounced entirely differently, while retaining much the same meaning. This, together with the fact that characters were fixed at such an historically distant time – despite efforts made by the Communist Party to reform and simplify many key characters – means that they can seem almost timeless. The gap between the two cultures is almost as marked: Western European thinking as exemplified by English and US culture continues to empiricise wherever it can no longer colonise, to be extroverted and individualist. This it does to almost the same extent that Chinese thought has traditionally focused on the phenomenal, while creating an enclosed and hierarchically ordered social system in which China is already a world, complete unto itself. Communism almost destroyed the infrastructure of that world-view while, fundamentally, it inherited the mind-set, translating it into a unique political and industrial complex, where the Party and capitalism are, oxymoronically, one and the same thing. Chinese literature is at once far more ancient and extensive than literature in English, and far more isolated on the far side of postmodernity, unable to establish easily connections with writers from millennia back, poets everyone has memorized but whose lives seem unimaginably alien. Thanks to those unchanging characters, everyone can read the poetry of the Tang or Song dynasties, but no-one can be entirely certain how it was pronounced. English literature, on the other hand, manifests its distinct periods through linguistic as well as cultural or formal evolution, regularly requiring itself to be translated into its latest manifestation. Somehow, that familiarity with mutability, with relative equivalences, and with the gaps in meaning that such familiarity both opens up and conceals, gave it a flexibility that seemed fit for the task. Somehow, when we sat down together to translate – line by line, character by character – the series of gulfs I’ve just described, each as sheer as the other, caused something rich and paradoxical to happen. For one thing, to discuss the surface of the language was, necessarily, to discuss its depths. For another, English’s focus on its music, its long engagement with different modes of metricality, connected with Chinese’s love of pattern, and its patterning of centuries of allusion. The historicizing music of English met the conceptualism of the Chinese character, and English’s concept of the poetic encountered Chinese’s very distinct tonal music. Each culture was mature enough in a different enough way to match the other technically as well as to contrast teleologically. There was vigorous debate because there could be real exchange: something, we realized with increasing excitement, was at stake. This entry was posted in current emanations and tagged Antony Dunn, Arthur Sze, C.D. Wright, Chinese poetry, Cove Park, Duo Duo, Eliot Weinberger, Fiona Sampson, Forrest Gander, George Szirtes, Hu Xudong, Julian Forrester, Linda France, Literature Across Frontiers, Mang Ke, Martin Orwin, Murray Edmond, Odia Ofeimun, Ouyang Jianghe, Pascale Petit, Poetry, Poetry Translation Centre, Polly Clark, Richard Gwyn, Robert Minhinnick, Scottish Poetry Library, Sean O'Brien, Tang Xiaodu, translation, Wang Xaoni, Xi Chuan, Xiao Kaiyou, Yan Li, Yang Lian, Yang Xiaobin, Yu Jian, Zang Di, Zhai Yongming, Zhang Er, Zhang Wei, Zhou Zan, Zoe Skoulding. Bookmark the permalink. Fantastic! I’m looking forward to getting hold of a copy.